Evaluation by an ophthalmologist is necessary Children can be born with or develop abnormalities of the eyelids. These abnormalities can be mild and require observation or can be significant and cause permanent loss of vision. 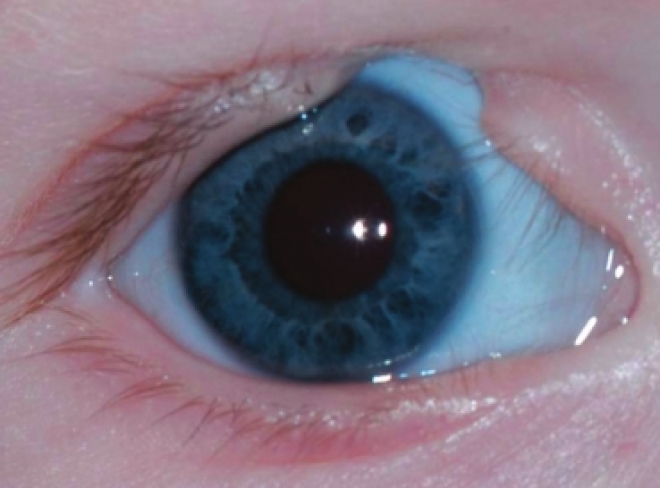 If there is a significant abnormality, the child should be seen by an ophthalmologist. Some of the more common abnormalities seen include: nasolacrimal duct obstruction, dacryocystocele, ptosis, entropion, ectropion, coloboma and ankyloblepharon. Nasolacrimal duct obstruction is one of the most common abnormalities seen involving the eyelids and lacrimal system. This occurs when the nasolacrimal system is not draining tears correctly. This is usually due to some area of the system being narrowed or due to a membrane blocking the system from draining. As a result, the tears build up and run down the face. Bacteria can build up and cause chronic discharge and crusting from one or both eyes. The tearing and discharge can be intermittent or constant. Often, parents will note that the eyelids are crusted and stuck together upon awakening. The symptoms usually begin about one to two weeks after birth. Fortunately, a large number of children improve with observation only. The parents can also be instructed on lacrimal compresses. This consists of applying pressure over the lacrimal sac and pushing downward. The parents may be given a prescription for antibiotics drops or ointment to help with significant discharge. If the symptoms do not resolve, a tear duct probe can be performed. Usually, a child is given until three to six months of age before considering this procedure. It can be done with an anesthetic eye drop and no general anesthesia up to about 20 pounds of weight. Once the child becomes larger, the procedure needs to be performed with general anesthesia. If a local probe does not work or probing is done under general anesthesia, we generally place a silicone stent, which will be removed in about three months or perform a balloon dilation of the passageway. Generally, all of these procedures correct the problem about 85-90 percent of the time with one procedure. Another type of nasolacrimal duct obstruction is caused by a dacryocystocele. This is when a cyst has formed in the nasolacrimal duct passageway. Symptoms usually start soon after birth with a swollen area in the passageway with tearing and discharge from the eye. If it is not treated, it can become infected and lead to hospitalization. Usually, the baby with be placed on antibiotics by mouth, placed on an antibiotic eye drop, and have a nasolacrimal duct probing to open the cyst. These can recur and require further treatment. Ptosis is a condition that means drooping of the eyelids. The drooping can cause mild to complete closure of the eyelid. If an infant has ptosis, he or she should be evaluated by an ophthalmologist. The ptosis may be due to a weak, underdeveloped levator muscle of the eyelid. This does not require further workup but may require surgical intervention. Other causes of ptosis need to be considered. If the child has only about 2mm of ptosis and a smaller pupil on the affected side, he or she can have a Horner’s Syndrome, which will require imaging looking for a lesion. The child can also have ptosis, an enlarged pupil and turning out of the eye that could indicate a third nerve palsy that may also require imaging of the brain. Another cause of ptosis could be due to a neurological disorder such as Myasthenia Gravis. This can be a cause of new-onset ptosis in a child and can cause significant systemic problems. This would require evaluation and treatment by a neurologist. Once the type of ptosis is determined, the amount of ptosis must be evaluated. If mild and not blocking the child’s vision or causing torticollis with a chin up position, it can be observed. If a newborn presents with complete or almost complete ptosis, he or she will need surgery soon. If not treated, it can lead to deprivation amblyopia and blindness. The child may also require treatment if his or her ptosis is blocking vision and causing the child to lift his or her head to see. If the ptosis is causing significant torticollis, then surgery to lift the eyelid can cause resolution of his or her head tilt. Other abnormalities of the eyelids include ectropion (turning out of the eyelid), entropion (turning in of the eyelid), anklyoblepharon (variable amount of attachment of upper and lower eyelid to each other) and coloboma (absence of part of the eyelid). All of these can be seen at varying degrees. Just like ptosis, it may be mild and require observation only. Other cases may be significant and require surgical correction to avoid damage to the eyes and loss of vision. 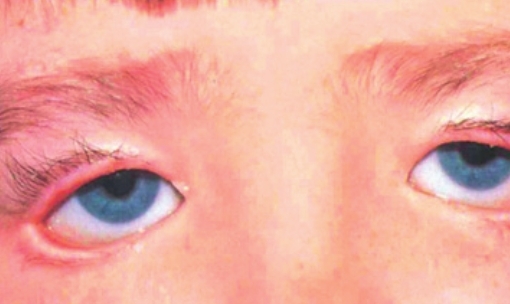 These are just some of the more common eyelid abnormalities that can be seen in children. If a child is noted to have any of these, he or she should be seen by an eye doctor. Many of the processes do not need further workup, but others may be a sign of an underlying serious condition. Even if it is an isolated problem of the eyelid, treatment may be required to develop the proper vision. Dr. John D. Hinrichsen is a pediatric ophthalmologist / strabismus specialist at Highland Clinic who devotes his practice toward the diagnosis and treatment of eye problems in children. He specializes in the treatment of strabismus, amblyopia, ptosis and nystagmus. He can be reached at (318) 222-8402, at his first-floor offices 1455 East Bert Kouns Industrial Loop, Suite 103, Shreveport, LA. He also sees patients at the Louisiana Eye & Laser Pineville office. To schedule an appointment, call 1-800-437-0153 or visit the website https://www.highlandclinic.com/staff/john-hinrichsen-md.